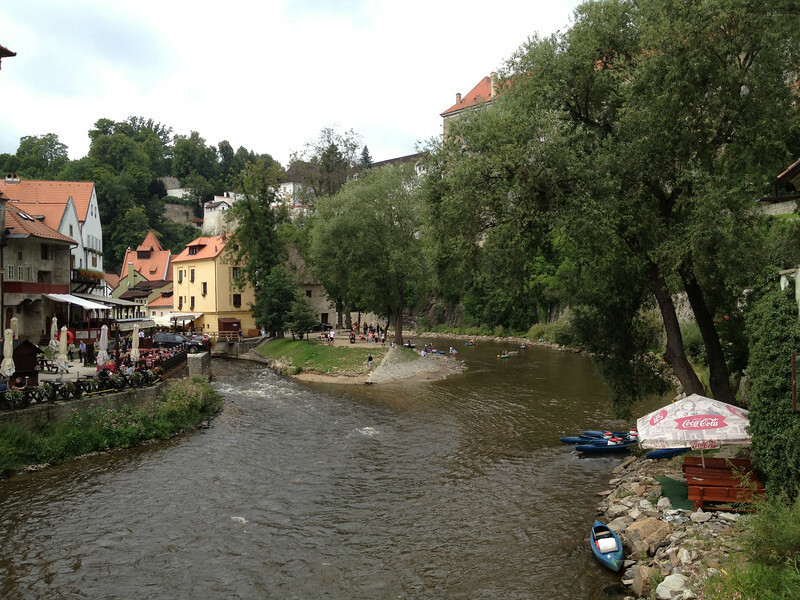 Rafting or canoeing down the Vltava River in Český Krumlov is a great way to spend a warm summer day. 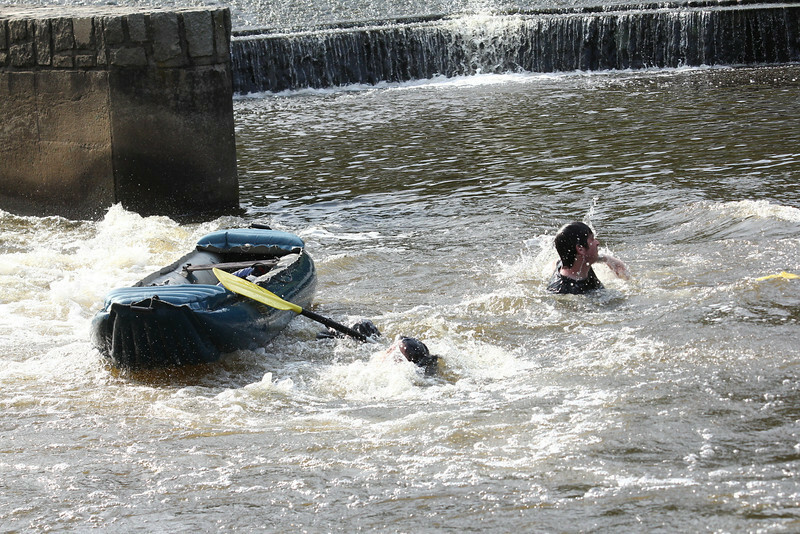 There are several companies in Český Krumlov that will rent you a kayak, canoe or raft. Prices depend on how far upriver you want to start your trip. We started at a point just past the bridge and paid 360 crowns which included a canoe raft, life jackets, a dry barrel for our stuff, and pickup at the end or our trip in Zlatá Koruna. This trip takes about 3-4 hours. Most of the photos in this post were taken on my iphone, which was encased in a waterproof pouch. This gave some of the photos a slight blur but it saved the day in the end. The Vltava river in Český Krumlov, Czech Republic. 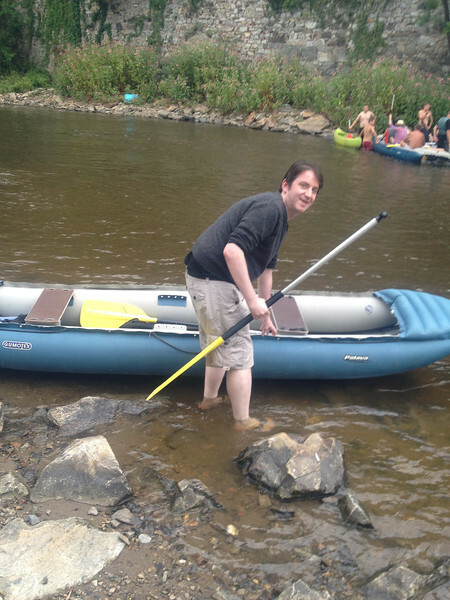 Micheal gets our canoe into the water. Micheal at the helm. Wait, does a canoe have a helm? Our first rest stop along the river. 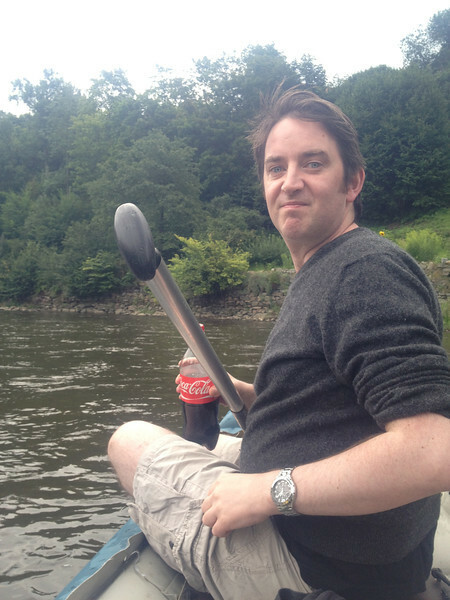 You didn’t think that the Czechs would raft down a river without stopping for a beer and a klobasa, did you? There are small pubs placed at convenient intervals along the river. 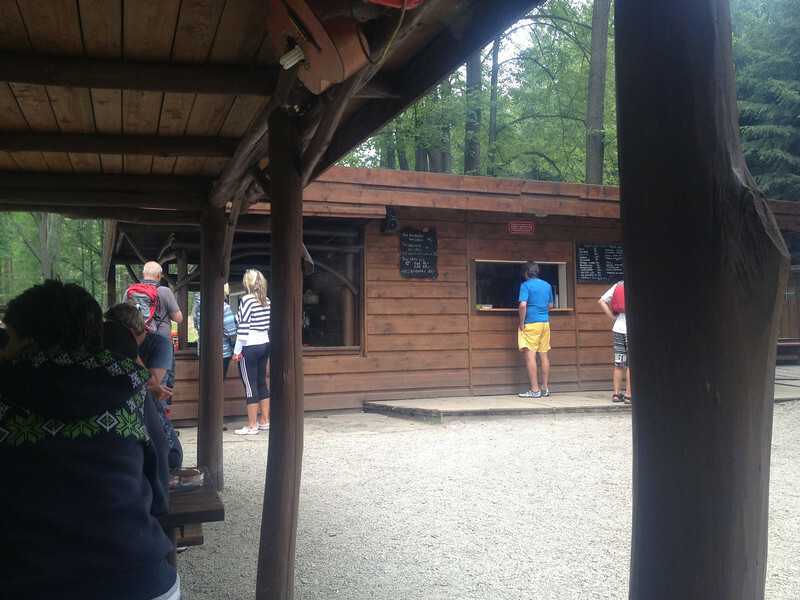 The food is limited to things like utopenci (pickled sausage), smažený sýr (fried cheese), and a variety of sausages. 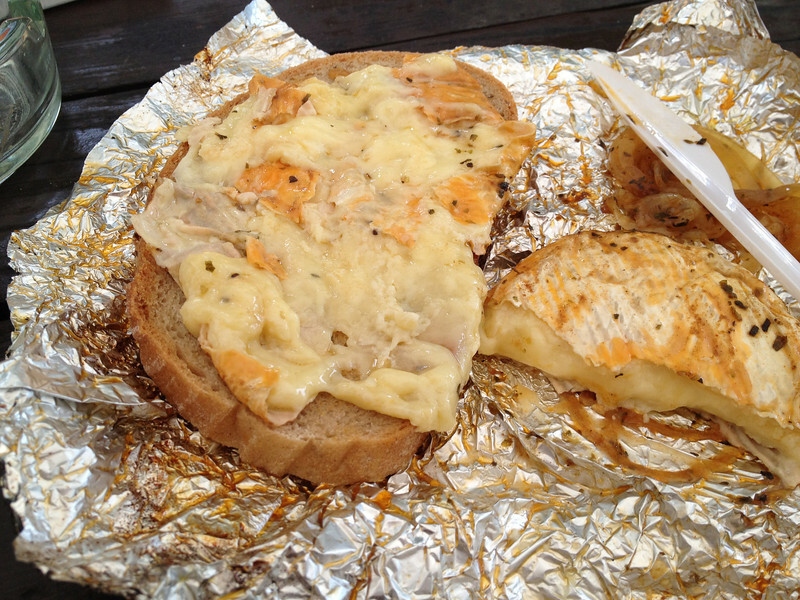 Grilled Hermelín cheese and onions, served with a slice of chleb. It tastes a lot better than it looks. This was not in the brochure! Yes, that black spot is my head underwater. When you reach Zlatá Koruna, there is a small weir. Everyone we saw go before us managed it easily. I’m not quite sure what happened but I think Micheal attempted to steer through it instead of just letting the river take us, and the canoe tipped us out. The water was only chest deep here but the strength of the river at this point made it very difficult to stand up and regain your balance. My first thought was to try to save the paddles that were quickly floating away from us because we would lose our deposit if we lost them. My second thought was, “Oh my God, where is my iphone”!! And this is where a 10 euro plastic dry bag saved my phone. It was still around my neck, perfectly dry. There were some representatives from Canon on the riverbank, taking photos of all the rafters finishing, so now we have that moment of humiliation captured forever. I feel a small word of warning is needed here. One of the hostels in Český Krumlov offers a river pub crawl. Having a couple of beers over the course of an afternoon is going to be okay for most people. However, many of the people we saw at the hostel coming back from the river pub crawl, were completely wasted and covered with small cuts and scrapes. I think some of them had brought their own bottles of vodka on the trip. This is stupid! Save your heavy drinking for after your river trip. You should always wear your life jacket when in the water, even though most of the river is quite slow and calm. What company did you use? and would you recommend them? The trip that you did, do you remember the exact name of the starting point, and without stops, how long do you think it would take? We started at a point just past one of the bridges in Cesky Krumlov center and ended in Zlatá Koruna. This took us 4 hours because we stopped twice for food or drink. The company will drive the boat to the water and also pick you up at the end of the trip and take you back to Cesky Krumlov. On the company website, it also shows a shorter 2 hour trip that might work better for you.